On 30 May 2014 Krassen Roussev and Bozhanka Dobreva from association European Institute of Cultural Tourism EUREKA participated in a meeting of leading companies and tourist associations from Varna with the Deputy Minister of Economy and Energy Branimir Botev and the Secretary-General of the World Tourism Organization to UN Taleb Rifai. On 27 and 28 March 2014 in Palermo, Sicily, were held B2B meetings between 350 companies from different European countries within the EEN - European Enterprise Network. Participation of Bulgarian companies was organized by the Chamber of Commerce Dobrich - member of EEN. 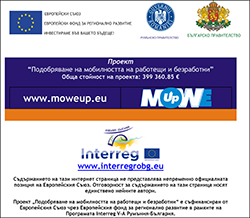 In the InterAct's promotional catalogue for 2013 is presented project "Cross-Border Istro-PonticDestination For Cultural Tourism" with lead partner NPO EUREKA. The catalogue, titled "Inspiring creativity", aims to promote the culture and creative industries in Europe and covers all European programmes for territorial cooperation: cross-border, transnational and interregional. The project CBDCT Istro-Pontic is the sole representative and example of good practice of the cross-border cooperation programme Romania – Bulgarian 2007 – 2013.